Do you know an exceptional Selkirk College educator? 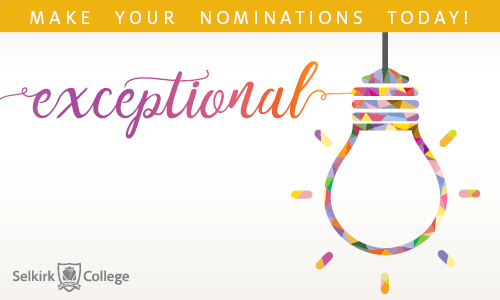 The Selkirk College Faculty Association’s (SCFA) Standing Committee on Professional Excellence (SCOPE) invites you to show your appreciation with a nomination for a SCOPE award. Selkirk College is an institution that prides itself on providing an inspired learning environment. Do you know an exceptional instructor who has inspired you, or contributed to your success during your studies at Selkirk? If yes, the Selkirk College Standing Committee on Professional Excellence wants to hear from you. You can fill out the digital nomination form and submit your nomination online. The nomination deadline is Monday, April 15, 2019. 2018/2019 SCOPE award winners are honoured at an event in September 2019. If your nomination is successful, you will be emailed with an invitation to attend. For more information please contact Carol Andrews, Chair of the SCOPE Committee. Learn about Selkirk College's 2017-18 SCOPE Award Recipients: Allyson Perrott, Muditha Heenkenda and Doug Henderson.